The Legend of Zelda: Collector's Edition is a collection of the two NES titles (The Legend of Zelda and Zelda II: The Adventure of Link) and the two Nintendo 64 titles (Ocarina of Time and Majora's Mask), as well as a 20-minute demo of The Wind Waker. 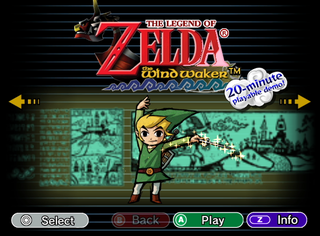 Unfortunately, the emulation quality prevents this from being an ideal way to play the games, with Majora's Mask in particular suffering from constant freezing issues that were not present in the original N64 game, sometimes leading to full-on lockups (which, due to the original game's quicksave feature, makes the journey much more difficult). In addition, the ending cutscene for Ocarina of Time was made into a 450 MB pre-recorded video file, perhaps due to issues with emulation. As an interesting aside, it's also the first game released in a PAL territory to completely ditch 50Hz support, and one of only three GameCube games to do so (the others being Metroid Prime 2: Echoes and Geist). 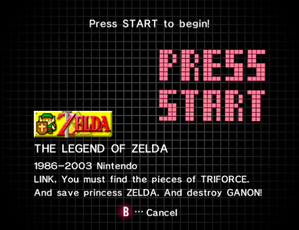 The tgc "discs" for Zelda 1 and Adventure of Link actually contain their own banners and text for the GameCube menu. The text is rather crude, so they most likely weren't meant to be visible, as the tgc "discs" for Ocarina of Time and Majora's Mask lack any info. The banners themselves are still used on the save files for the respective games. The text for Adventure of Link is actually too long and gets cut off. 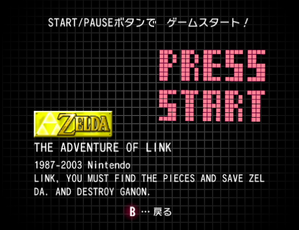 It should end with "adventure some quest yet..."
The Japanese Zelda Collection still has a banner with text for both games, but for some bizarre reason uses the name and copyright for Adventure of Link and text describing Zelda 1 for both. The banner itself also has a different design, possibly an earlier version. The text is slightly different, written in all-caps English and has less prettier formatting. If viewed on Dolphin, the description for the Japanese tgc "discs" is actually much longer and contains the text for Adventure of Link! At least what seems to be left of it, anyway. The game has a ludicrous amount of debugging and SDK messages, such as references to N64 accessories. Due to the game's structure, they are duplicated multiple times throughout the filesystem. 80139964		Exception:#### INTERNAL ERROR #### Cannot match exception-handler! 8013AAB8		Get: DRAM Address: WRITE-ONLY? 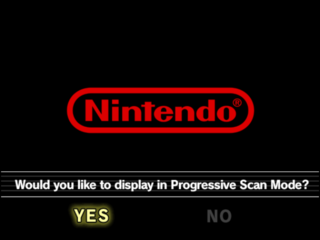 In the Japanese version, the progressive scan prompt appears following the Club Nintendo logo sequence. The US version has a darker look consistent with the rest of the game. 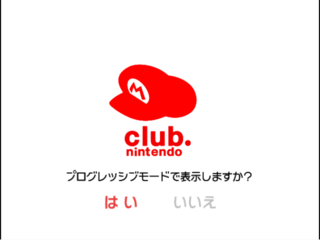 The Japanese and international versions have different menu music. Additionally, the Japanese version gives more specific release dates for each game. This page was last modified on 15 March 2019, at 10:43.